Pacific Northwest Ballet bills Coppélia as “the happiest ballet on earth,” and that’s not far off: it’s a comedy where young and old do silly things like fall in love with dolls and sneak into houses, and, of course, it all works out in the end. The ballet is perfect for spring and perfect for broad audiences—kids, first-time dance-goers, consummate ballet lovers—and it continues through April 24. This production features choreography by Alexandra Danilova (herself famous for the role of Swanilda) and George Balanchine, after the Marius Petipa version they both knew well growing up a century ago in the Russian Imperial Ballet system. Pacific Northwest Ballet principal dancer Lesley Rausch in Coppélia, choreographed by Alexandra Danilova and George Balanchine © The George Balanchine Trust. Coppélia tells the story of a pair of young lovers, Swanilda and Franz (Lesley Rausch and Jerome Tisserand at the April 15 opening), and of Dr. Coppelius (William Lin-Yee), who tinkers with dolls in his secret workshop. In Act I, Swanilda, a clever young woman with a sense of humor, discovers that Franz, something of a charming ditz, has fallen in love with the mysterious Coppélia, who sits in the window of the workshop and has not yet been revealed to be a doll. In Act II, Swanilda and her friends sneak into the workshop, only to be chased away by Coppelius—all except Swanilda, who hides and disguises herself as Coppélia. Franz also sneaks in to woo Coppélia, but Coppelius drugs him in order to work an experiment that will bring his beloved doll to life. Swanilda plays along, fooling Coppelius just long enough to escape with Franz. Act III marks the wedding of Swanilda and Franz as well as a village festival of the bells. Pacific Northwest Ballet principal dancers Lesley Rausch as Swanilda, and William Lin-Yee as Dr. Coppelius, in Coppélia, choreographed by Alexandra Danilova and George Balanchine © The George Balanchine Trust. Rausch and Tisserand combined comedy with superb technique as the principal couple. Rausch’s comedic moments as Swanilda shone brightest in Act II, when she interacted closely with Coppelius and Franz; her timing as a would-be doll coming to life played well against Lin-Yee’s slightly doddering, slightly devious Coppelius. Throughout all three acts, Tisserand’s Franz remained a bit of an airhead—which makes for good comedy but also makes you wonder how Swanilda puts up with him. The couple’s third act pas de deux, however, was sweet and loving, and beautifully danced. Rausch’s long lines and precision brought a maturity to Swanilda’s character; Tisserand’s elegant manner and soaring batterie lent a note of sincerity to Franz. Coppélia is loosely based on E.T.A. Hoffmann’s story The Sandman. Although the ballet retains none of the original’s dark narrative (like many a reworked ballet plot), Dr. Coppelius’ workshop in Act II provides plenty of uncanny imagery. Naked, faceless doll forms hang from the rafters painted on the scenery. Four dolls move stiffly and repetitively enough to appear to be actual automatons rather than dancers in costume. Dr. Coppelius’ character, too, takes on a discomfiting edge as he grows more interested in his doll as Swanilda brings her to life. Pacific Northwest Ballet principal dancers Jerome Tisserand and Lesley Rausch with company dancers in Coppélia, choreographed by Alexandra Danilova and George Balanchine © The George Balanchine Trust. A few dances did not quite match the exuberance of the score—particularly the folk dances in Act I—but it was unclear whether this was a fault of the staging or of the performance. Along the same vein, Balanchine’s re-choreographed Act III sometimes felt disconnected from the Romantic score: although the act is a series of divertissements with minimal narrative action, his choreography seemed too heady for Léo Delibes’ music, not quite warm enough in tone. I have the same critique of the final act of his Midsummer Night’s Dream as well as his Nutcracker (as worthy a Seattle Christmas tradition as it will surely prove). There is little bridge between enchanting story and pure dance, and Balanchine’s pure dance often looks strange outside of practice clothes (or, at least, costumes that show the full line of the ballerina’s leg). Part of these observations are undoubtedly grounded in personal aesthetic, but they are also a consequence of seeing Balanchine’s work farther and farther away from the twentieth century he so defined. 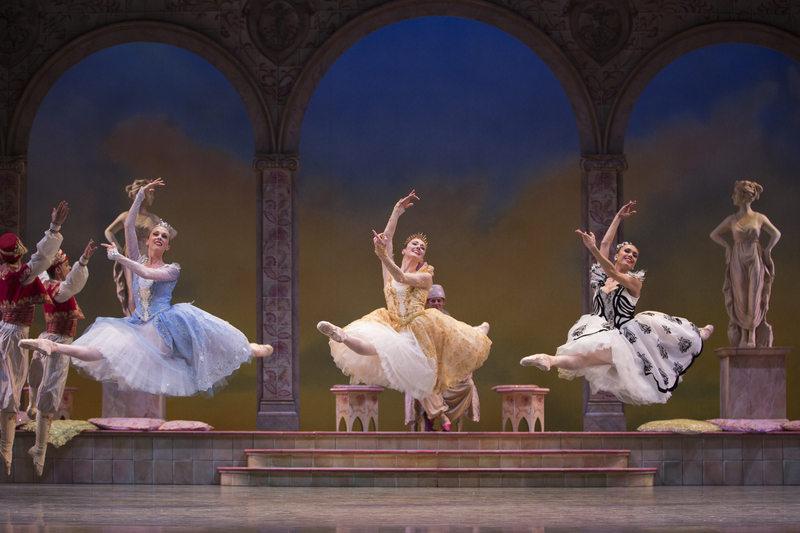 Pacific Northwest Ballet soloists Kylee Kitchens and Sarah Ricard Orza, and principal dancer Noelani Pantastico, with company dancers in Coppélia, choreographed by Alexandra Danilova and George Balanchine © The George Balanchine Trust. Nevertheless, Act III also had its perfect Balanchine moments, including the 24 girls in pink tutus who made a corps de ballet for the Waltz of the Hours and other divertissements. The young dancers brimmed with joy, and they were impeccably rehearsed. Margaret Mullin led the Waltz with pristine grace, but she shared the stage with the children, rather than becoming the focus of the dance. Other standout divertissements included Noelani Pantastico’s Spinner variation and the lilting, playful quartet of Jesterettes (Madison Abeo, Angelica Generosa, Angeli Mamon, and Nicole Rizzitano). PNB’s production of Coppélia is ballet’s version of a romp: playful, funny, and full of life. The comedy ensures that the ballet keeps a quick pace, and the gorgeous scenic design by Roberta Guidi di Bagno (the wisteria in Act I!) gives you something to look at if, by some twist of fate, the dancing gets old—which it won’t. 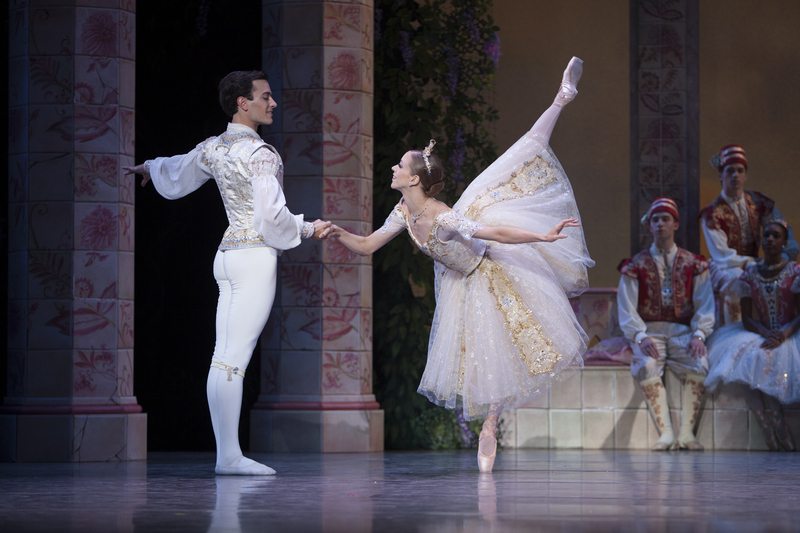 Pacific Northwest Ballet’s Coppélia continues Thursday–Sunday, April 21–24, at McCaw Hall. Tickets and information here. Your comments about stylistic difficulties reminded me — I’ve been thinking about reconstruction lately, and am wondering how the current flurry of works that are drawn from older sources (notes and notation) affect how we see these pastiche productions. Not sure if you were at the lecture demonstration with Doug Fullington where he showed the reconstruction of the Spinner choreography from notation — it’s got a lot of similarities to the work as it’s danced at PNB today, so some of that dissonance may not be Balanchine’s doing. When this production premiered in 1974, there was a lot of discussion about Danilova reconstructing from memory, and how thrilled people were to have that kind of connection to the past — there really wasn’t any conversation I remember about how Balanchine’s contributions did or didn’t reflect the French style. And of course, Danilova herself was restaging the choreography as she knew it from the Ballet Russe, which is a kettle of fish all on its own.